From the first time we picked him up at 8 weeks old, we instantly fell in love with him. He was a sweet boy with an amazing spirit and a zest for life! He loved hugs, rides and walks on the beach. As Joey grew older, he managed to convince me that we should have a beach house so he could enjoy endless walks by the ocean and smell the salt in the air. 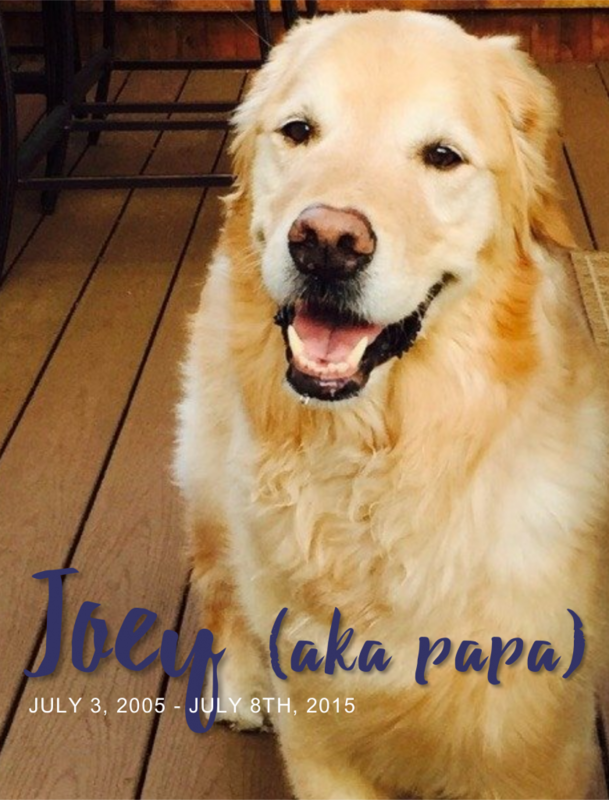 Days before we were to close on the house, Joey was diagnosed with an inoperable hemangiosarcoma of the heart. The night ended with a colorful fireworks display, which he absolutely loved! My sweet boy passed a few days later. In his short 10 years, he managed to teach me so much about life and myself. He taught me the value of quality verses quantity. His appreciation for what I thought was the smallest things seemed to penetrate into a life of gratitude. I will forever treasure our time together and the bond we shared. Please, if you have a dog that is currently battling cancer, have lost a dog to cancer, or know someone who’s dog is currently fighting for their lives, please help us to raise money and awareness. A Golden Wish offers custom-designed apparel and would appreciate your help in supporting our cause. 10% of all sales are donated to the Morris Animal Foundation’s Golden Retriever Canine Lifetime study, where they work day and night to help fight this horrible disease.